We’ve all worked with a few burnt out teachers and thought, “Why don’t they just retire already?” Some of us have BEEN the burnt out teacher and thought, “When can I just retire already? 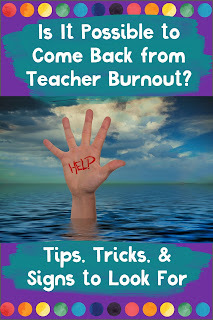 ?” Is it possible to come back from teacher burnout? Can it be prevented? What causes it in the first place? Teacher burnout is a touchy subject, especially when we worry about it happening to us. No one wants to be the burnt out teacher. And it isn’t something you can speak of openly in the workplace without eavesdroppers wondering, “Who are they talking about? Is it ME?” But the only thing worse than being a burnt out teacher is having a teacher struggling with burnout. An overwhelmed and unhappy teacher can unintentionally have a negative impact on students and classroom environment. Who wants to learn with a grumpy and negative teacher? A teacher with a bad attitude can create a room full of students with bad attitudes, which in turn adds more stress, pushing her even closer to burnout. Soon, everyone in the room is grumpy and negative and has a bad attitude, with very little learning going on. The turnover rate in education is hugely impacted by teacher burnout. Surveys reveal that teachers often feel stressed out and overworked with too little time and support to tackle their responsibilities. Many teachers report having inadequate resources, inefficient administration, and inadequate training in areas they are expected to handle. Teachers are pulling their hair out trying to stay afloat in an extremely demanding job, often with little notice or concern from their administrators, parents, and the general public. 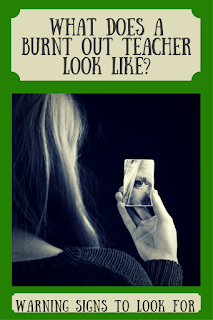 What Does a Burnt Out Teacher Look Like? Well, to be honest, sometimes it looks like you. And me. And any other teacher you know. Sometimes you can’t tell a teacher is struggling. Many teachers put on a big smiley face and forge through the day despite feeling overwhelmed and exhausted. It isn’t just the grumpy-face lady down the hall. It can be the cheery smiling teacher too. It might even be you at some point. I’ve gotten to know the lovely author Colleen Shmit over the past few months and she speaks from the heart in her brutally honest book called (brace yourself) “Crisscross Applesauce and Shut the Hell Up.” She shares personal stories of starting out as an optimistic, bright-eyed teacher filled with inspiration and hope…and how she slowly morphed into the burnt out grumpy face lady down the hall. She tells a tale that many of us can relate to. 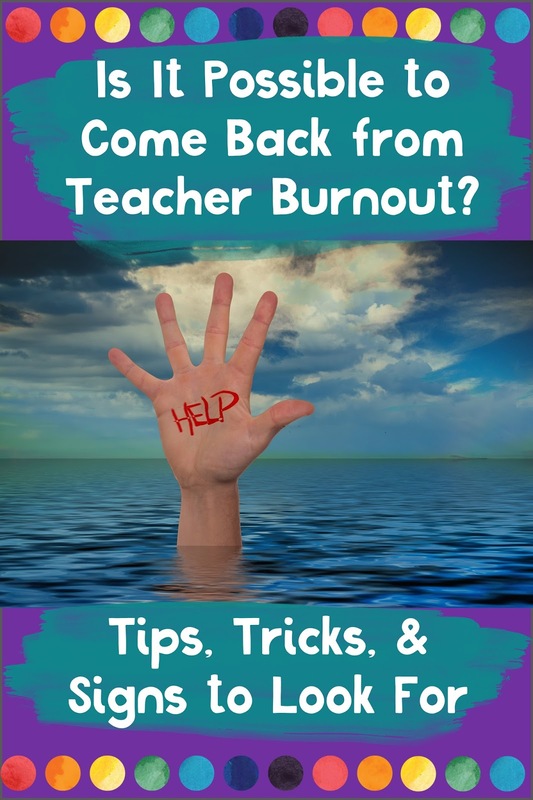 Shmit gives great advice on how to rekindle that teacher spirit and how to be an effective teacher…without burning out in the process. 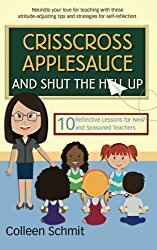 It’s a quick and easy read and is intended for both new and seasoned teachers. Make sure you’re following Exceptional Thinkers on Facebook and Instagram because I just might be giving this book away in the near future (Hint, hint)! 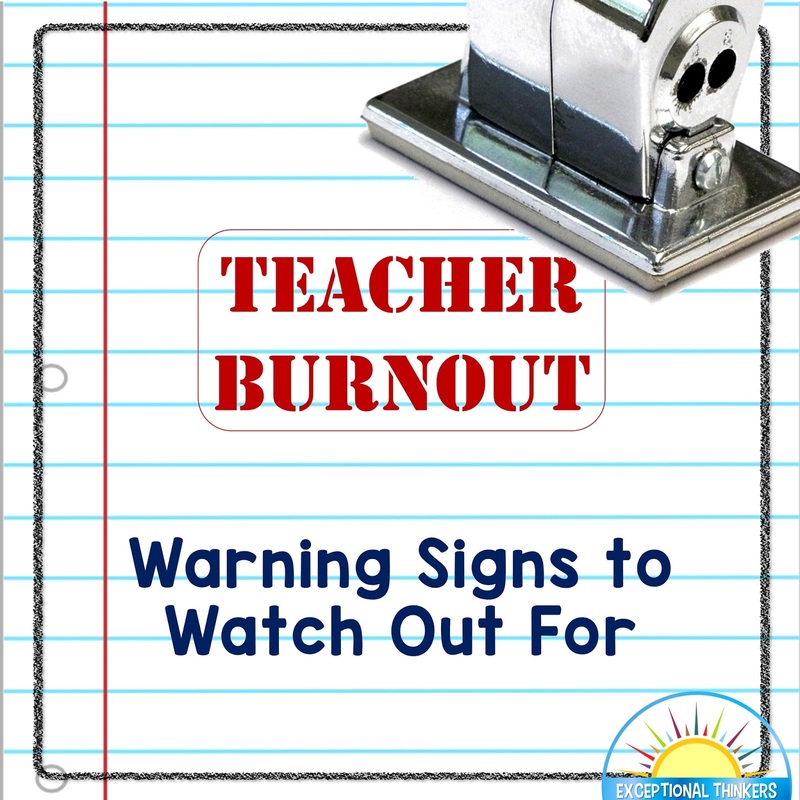 What are the Warning Signs of Teacher Burnout? Is there such a thing as mom burnout? Because I think a lot of parents can relate to these signs. Heck, I think most people in general have felt this way at some point in life. The symptoms aren’t exotic but they can be detrimental to the classroom environment. 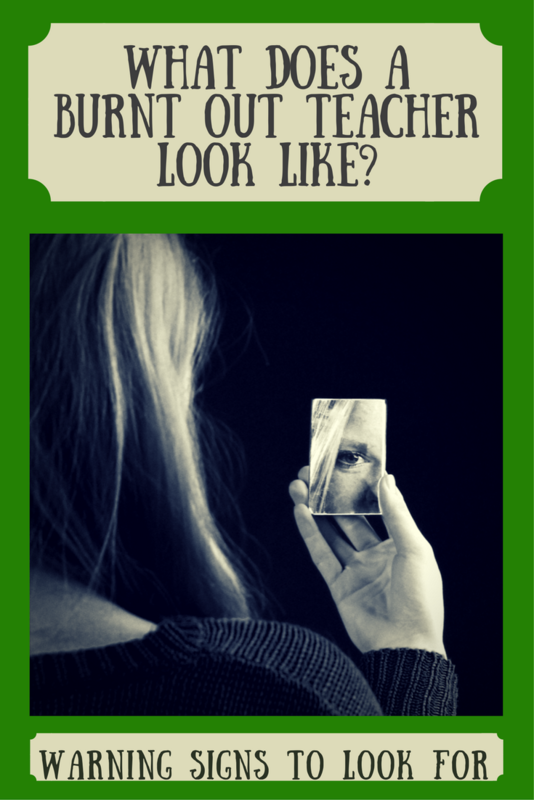 If you recognize these signs in yourself, fear not and read on. Can Teachers Come Back from Burnout? One word: Absolutely! Teacher burnout isn’t a death sentence. There is hope for everyone, even the grumpy-face lady down the hall. Teaching is an extremely demanding job, and an underappreciated one at that. You may not be able to control your teaching assignment, but you can control what happens in your own classroom and how react to the stressors in your life. Many teachers report that having a good support system helps them to deal with stressful situations in school. Establishing a good rapport with coworkers can help tremendously, even if it is just to support each other during challenging times. If seeking support in your building is not an option, you may prefer connecting with other educators online. There are many Facebook groups and other online communities where you can find teachers to connect with. Another big complaint from teachers is that they often do not have the resources they need in order to teach and do what is expected of them. If you haven’t already discovered the website Teachers Pay Teachers, you need to do it today. There are tons of awesome resources and many of them are free. It’s like Etsy for teachers. 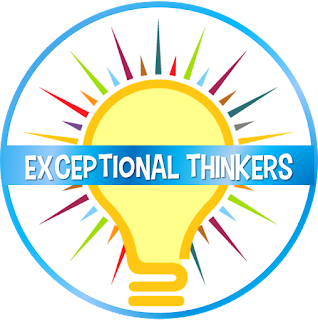 While you’re there, make sure to stop by my store, Exceptional Thinkers. I have a couple of freebies on there you might like. 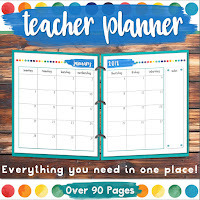 While we’re on the subject of helpful TPT resources, I just have to quickly tell you about my new Editable Teacher Planner that I just created to get my life in order. I was drowning in responsibilities and needed a way to manage everything. I like lists, organization, and colorful things (Maybe it’s a teacher thing). I was all over the place and this editable planner got me focused and on track with goals, lists, organization, and all the things I like. And it’s cute. But anyway, when it comes to keeping your sanity in the classroom (and in general), it is important to keep in mind that you cannot control others, you cannot control what happens around you, but you can control yourself. This is something I needed to learn, and it is easier said than done. I struggled with teacher burnout very early in my career, working in a self-contained program for severely disabled students. One particularly difficult day I found myself in a moment of panic. The students I had that year in an autism program were extremely violent and on this day, I was dealing with multiple meltdowns. I looked around my classroom and wondered how on Earth I could be expected to manage such a challenging group. In this moment, I looked down and spotted a piece of paper. It was from a fortune cookie from my lunch (I ordered chinese food to treat myself that day). It read," Be calm like a giant tree in a storm." That's it. That's all it said. But it made all the difference to me in that moment, and for the rest of the year. I pinned that fortune above my desk because it resonated with me. I wasn't the storm and the storm wasn't me. I needed to be the tree rooted in the ground. Someone had to provide stability and as the teacher, that someone needed to be me. Sure, I could bend and sway in difficult moments, but I must not ever get swept up in the storm. I still have that fortune over a decade later. You get to decide if you'll start the day off with a smile or a frown. When things become overwhelming, take a breath and remember to separate yourself from the problem. You can't choose your problems, but you do get to choose how you react to them. 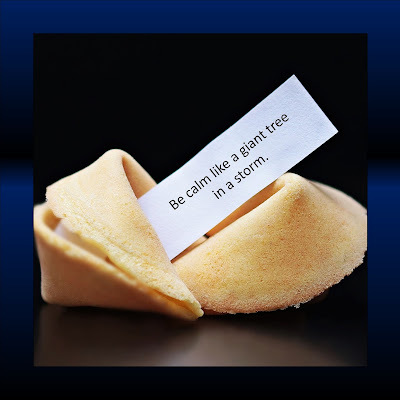 Remember to be the tree and don't let yourself get swept up in the storm. At the end of a rough day, go home on time and leave your teacher stuff in the car. Leave your teacher problems and stress in there too. Don't bring the storm home with you. Relax. Be with your family. Be you. Try meditation or yoga. They work wonders. Do whatever it takes to recharge and let go of the pain and stress building up at work. Then tackle it the next day with a clear mind. I highly recommend looking into online teaching communities for support. Look into Teachers Pay Teachers and other online websites for helpful resources. There are a ton of fantastic resources available online, many of them free. They can help fill in any gaps that your curriculum may have (for those of you who even have a curriculum). And breath. You are not alone. You can do this. If you have any tips or something to share about Teacher Burnout, I would really love to hear from you. You can connect with me on Facebook, Instagram, and even Pinterest. I'll be sharing this blog post, so you can comment on it there or PM me directly on any of those accounts. And by the way, I just couldn’t write about Teacher Survival without mentioning my colleague Nikki Tester’s Ultimate Substitute Teacher’s Survival Kit. It’s a massive collection (over 2,000 pages) of resources with everything from advice, to lesson plans, to printables, and activities for every subject imaginable. I got lost in this enormous resource. Once you dive into it, don’t forget to come up for air! If you're feeling burnt out, I hope you've found this post helpful. Remember that you can turn it around. Be the tree, not the storm. 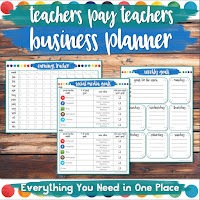 Update: I liked my new Editable Teacher Planner so much, I went and completely redesigned my TPT Business Planner to coordinate with it. So if you’re a seller on TPT, you might want to check that out. It’s a game changer. At least, for me it totally was. Are you a disorganized organization freak? Me too. Did I make that term up? Maybe. But these planners have been life changing for me, no joke. I hope they help you and I wish you the very best of luck in the rest of your school year!